The Cuisinart Chef’s Convection Toaster Oven (model TOB-260N) wins our award for the Best Toaster Oven based on its combination of excellent cooking results, food capacity and convenience features. Toaster ovens are one of the most versatile appliances in our kitchen. We rely on them to make toast, reheat pizzas and bake smaller items when it doesn’t make sense to heat up our full-sized ovens. Too often, however, toaster ovens end up being a jack-of-all-trades, but a master of none; delivering unevenly cooked toast and burnt pizzas and having too little capacity to really be useful for baking. So we set out to find the best toaster oven, one that would nail all the day-to-day basics, as well as serve as a reliable oven substitute. We looked for full-size models that had enough capacity to handle six slices of toast, a 12-inch frozen pizza or roast a 3-lb chicken. Convection cooking was also key for both the speed and cooking evenness it offers. And finally, we looked at both consumer reviews and other professional reviewers to ensure that the models we picked offered the highest levels of consistent performance. We ended up settling on four models: the Breville Smart Oven Plus #BOV810BSS ($250 on Breville.com), the Cuisinart Chef’s Convection Toaster Oven #TOB-260N ($235.45 on Amazon), the Hamilton Beach Set & Forget Toaster Oven #31230 ($89.99 on Amazon) and the Kenmore Elite Digital Countertop Convection Oven #0876771 ($149.99 on Kenmore.com and through Sears). 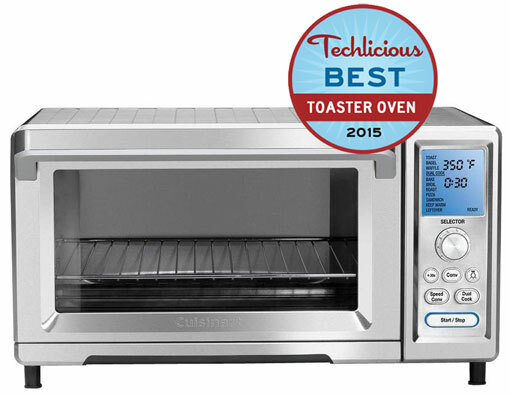 And we found our pick in the Cuisinart Chef’s Convection Toaster Oven (model TOB-260N). The Cuisinart delivered excellent cooking results throughout our testing and offered more food capacity and convenience features than any of the other contenders. It is the Best Toaster Oven. Note: most of our commentary on the Breville BOV810 applies equally to the BOV800XL ($249.95 on Amazon - same features, except without slow cooking feature) and BOV845BSS ($269.95 on Amazon - same features, except includes oven light). Each model we tested could fit our 3-lb chickens and 12-inch pizzas without issue. However, the Hamilton Beach Set & Forget Toaster Oven, the smallest unit we tested, could not fit 6 slices of toast as advertised, requiring us to trim off about a half-inch for testing. The Cuisinart Chef’s Convection Toaster Oven offered the most interior capacity of .95 cubic feet, about 20% more than the second largest contender, the Breville Smart Oven (.8 cubic feet). In fact, the Cuisinart’s interior is large enough that it can actually cook with two interior racks at once (included in the box). The Kenmore Elite Digital Countertop Convection Oven, which doesn’t provide an official interior capacity, falls between the Breville and Hamilton Beach. While there’s no doubt that the superior interior space of the Cuisinart makes it the winner in this category, those with little countertop space should remember that big inside also means big outside. With my NYC- sized kitchen, only the Hamilton Beach fit in the space where we typically keep our toaster oven. Any device that includes “toaster” in its name should be able to toast. Not something that my old Cuisinart lived up to. We were looking for six slices of toast that were evenly cooked no matter where on the rack they were in and had the same level of toastiness on the bottom. So we popped the slices in, set each toaster to “Medium” and let them go. 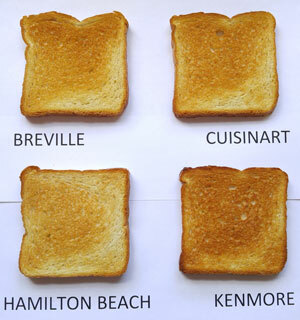 Toasting evenness has a lot more to do with your bread than your toaster. As you can see in the comparison shots, the top of the slice was consistently more toasted than the bottom, regardless of toaster or orientation. We presume this is due to lower moisture levels at the top of the loaf. Once you get past the issues with the bread itself, all the toasters offered roughly the same level of evenness. “Medium” means different things to different manufactures. The Kenmore slices were very lightly cooked, while the Cuisinart were bordering on overcooked. For whichever toaster you get, you will learn the settings and plan accordingly. (This video clip says more about arbitrary consumer electronics scales than we ever could). Next, we wanted to test out toasting speed. After all, no one wants to sit around in the morning waiting for their toast to get done. So we let each model go for 4 minutes then pulled out the bread to evaluate the level of toastiness. What we found is that the Kenmore provided the most toasting, just ahead of the Cuisinart and Breville, while the Hamilton Beach provided the least. And if you like your English muffins crispy, the Hamilton Beach was also unable to fully brown one, even when set on “Dark”. We also didn't like the fact that Hamilton Beach didn’t have a “bagel mode”, which lets you brown just the top part of your bagel or English muffin, nor did it have a countdown timer to tell you when your toast would be done. All the other models offered both. We tested each of the ovens on a frozen 12-inch pizza using their pre-defined “pizza modes”, when available, or else followed the directions on the pizza box. Two of the ovens, the Cuisinart and the Kenmore, also come with pizza stones included in the box. However, since both stones arrived broken and the other ovens didn’t include them, we went without. The results were clear that those ovens that cooked slowest, the Kenmore and the Hamilton Beach, also cooked the most evenly. The Cuisinart, which cranked out the pizza a few minutes faster than the others, was the least even. That being said, I'm actually calling this one a tie. Because the pizza modes on any of the ovens can be customized to cook at whatever temperature you want (you don't need to stick with the factory preset), it’s a simple matter to dial down the Cuisinart and Breville to cook slightly slower. And our six person taste test (including three hungry kids), found that all the pizzas tasted pretty much the same, regardless of how even they appeared on top. Cooking pizzas is fine, and all that, but to really be an “oven” the contenders needed to prove their worth as a true substitute or backup for the full-sized oven in our kitchen. So we went with the standard dish that every oven needs to be able to nail—roasting a chicken. We used four identical 3.5-pound birds for our test. The birds were seasoned with salt and herbs and popped in the ovens to convection cook at 400F until our thigh temperature measurements were at 160F using a Thermopen. The Hamilton Beach includes a built-in temperature probe, so we stuck that in the chicken and set it to 160F, as well (at which point the oven beeps and shut off). All four of the ovens did a surprisingly good job with the birds - better, actually, than our non-convection standard kitchen range. But the Cuisinart Chef’s Convection Toaster Oven was the runaway winner here. Its “Speed Convection” mode delivered the fastest cooking time, evenly cooked meat and, most importantly, beautifully browned skin. The Kenmore was the slowest of the lot, taking 10 minutes longer than the Cuisinart to fully cook the bird. The small Hamilton Beach produced chicken that was paler on the sides than the others. Its temperature probe was useful, but still required double checking with our Thermopen to make sure that there weren't underdone areas. 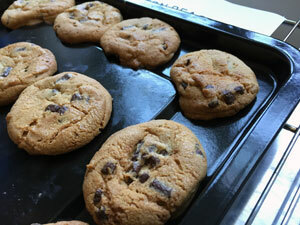 What better way to finish off our testing than with trays of freshly-baked chocolate chip cookies? We used store-bought dough (hey, this is a toaster oven review, not a cooking class!) and baked at 350F for 12 minutes. The slower cooking Kenmore delivered the most even browned cookies, followed closely by the Breville, but the Cuisinart and Hamilton Beach weren't far behind. The Hamilton Beach’s tray’s raised center caused the cookies to have a drooping effect, similar to the melting clocks in a Salvador Dali painting, but it didn't affect the taste. The Breville Smart Oven Plus, the Cuisinart Chef’s Convection Toaster Oven and the Kenmore Elite Digital Countertop Convection Oven all use a combination of knobs and buttons to set the various cooking modes and temperatures, whereas the Hamilton Beach Set & Forget uses a digital touchpad. The Hamilton Beach controls are the easiest to use, though they lack certain basic functions, like a bagel mode and a countdown timer for toast. The Cuisinart and Breville were more complicated, with various cooking settings – from the type of food, to the number of toast slices, to whether your dish is frozen or not frozen – as well as convection levels and cooking times. If it all sounds confusing, it is. But after a few times through you get the hang of it. And, once you have your cooking presets set the way you want them (e.g., you can dial down the temperature for Pizza mode or turn off convection for Cookies), the process is pretty easy. The Kenmore operates the same way as the Cuisinart and Breville, but doesn't display the entire list of presets as you’re scrolling, showing only the preset you’re on and forcing you to guess when the preset you’re really looking for is going to come up. Surprisingly, given its high price, the Cuisinart’s control knob felt cheaper than the Breville and the Kenmore’s, with the “clicks” not always lining up to menu choices on the display. The Breville was unique among the models in offering a slow cooking feature, allowing you to cook for up to 10 hours at a low temperature. Nice to have, but we usually associate slow cooking with larger quantities, where a Crock-Pot or standard oven seems more appropriate. The Cuisinart and the Breville both have clocks on their displays; the Hamilton Beach and Kenmore do not. With their small door openings and hot metal surfaces, both inside and out, we considered the safety of my toaster oven to be an important consideration. This is especially true for families where children use the toaster oven frequently to make toast and reheat pizza. In this department, the Breville and Cuisinart again stood out from the less expensive contenders. Both have catches on the doors (magnetic for the Breville and a hook for the Cuisinart) that will automatically pull out the cooking rack – no need to reach in to grab your hot trays. Each also has a safety catch on the main rack level to prevent the rack from sliding out all the way. The Kenmore won’t pull the rack out automatically, but it, too, has a safety catch. The Hamilton Beach has neither auto pull out nor a safety catch, making it the most dangerous of the lineup; on more than one occasion, we accidentally pulled out the entire rack, and then scrambled to keep a burning hot rack of food from sliding onto the floor. The Kenmore Elite Digital Countertop Convection Oven’s metal handle is attached directly to the toaster, with no insulating material in between. As a result, during long cooking times, the handle becomes extremely hot, creating a burn risk. None of the other toasters suffered from this defect. The Cuisinart was the only model in our group that had an interior light, which we found handy, especially given the oven’s relatively cavernous size. The Breville BOV845BSS, which wasn't available at time of testing, includes an oven light for an extra $20 over our tested model, the BOV810BSS. All of the ovens in our test have a large number of user reviews available, except the Kenmore, making it easy to evaluate how reliable they would be and whether our results were “typical” for the model. The Cuisinart tops the charts with a very strong 4.8 out of 5 star rating on Amazon and no major complaints. The Breville does pretty well, too, with 4.5 out of 5 stars for the similar models (Amazon doesn't carry the BOV810 yet), though there were some issues with units dying shortly after warranty and poor customer service. Hamilton Beach rated a 4.1 out of 5 stars, with 15% 1 and 2 star reviews, mostly due to product failures. The Kenmore is only sold through Sears stores; there were 14 reviews available, 13 of which were positive. Should you experience problems, the Kenmore comes with a full 5-year warranty; the Cuisinart has a 3-year warranty; while the Breville and Hamilton Beach only come with 1-year warranties. The Cuisinart Chef’s Convection Toaster Oven performed at or near the top in all of our cooking tests. And, it offers more food capacity than any of the other models we tested, making it the most viable substitute for your full-sized home oven. It also happened to get the strongest user reviews on Amazon, demonstrating that this is a consistent top performer. It gets our pick for the Best Toaster Oven. The Breville Smart Oven Plus was nearly an equal to the Cuisinart in performance and had a control knob that felt more robust. It only missed being our pick due to its smaller interior capacity (.8 cubic feet vs the Cuisinart’s .95). For those looking for a slightly smaller model (or who value a slow cooker function), this would be an excellent alternative to the Cuisinart. Meanwhile, the Kenmore Elite Digital Countertop Convection Oven was stuck in the middle; not as good as the leaders, not as cheap as the Hamilton Beach. You probably wouldn't be unhappy with it but, if you have the money, you're better off with the Cuisinart. $235 for a toaster oven is ridiculous! I agree, who really goes out and spend $235 for a toaster oven. I think the review should been a little more practical, like under $50 toaster oven review, or even keep them under $100, and see how those perform. The Breville toaster ovens at $200+ have been very popular models (the Cuisinart model is relatively new). So, many people are willing to pay that amount for an appliance they use all the time. Same for other high-end kitchen products, like the Kitchen Aid stand mixers or Vitamix blenders. That said, one sub-$100 model, the Hamilton Beach, did make it into our testing group (it is the only model under $100 we felt would be competitive). Is it as good as the more expensive models? No. But it will give you solid performance. who needs a real oven? I’ve been using a large countertop oven for years, ever since the oven in my stove went on the fritz nearly 15 years ago. I have found no need to replace the stove since the countertop oven is large enough for my household’s needs, we even make holiday turkey with it. Food cooks quickly and efficiently, more so than any stove oven I have used. I found this article really helpful, our well-used 15 yr old countertop may be giving up the ghost soon. Thanks for considering capacity in your review. My family and I are enjoying our second Cuisinart (same model) in 10 years. We wore the first one out! Our 40-year-old wall oven finally croaked and we bought the first Cuisinart while we decided what to do about the wall oven. Meanwhile, about 4 years in, the Cuisinart died, but it had proven such an awesome appliance, we bought another one immediately. We ended up getting a bigger top-of-the-line wall oven and it was then we realized that the Cuisinart cooks better, more coolly, and quicker than the wall oven, which is now used only at holidays or as occasional second oven when needed. And when this one kicks, we’ll buy another one. They are really good. The size is its only limitation. I have the Breville Smart Oven and I love it. I’ve had a previous Cuisinart model and it wasn’t nearly as good as my Breville. And yes…I would spend that much on a toaster oven again. No regrets. I had an older model Cuisinart convection toaster oven that was pretty awful. However, the model above is in a completely different class. It blows away our old Cuisinart in every way possible. I prefer it over the Breville for the reasons I mention above, but they are both excellent products. I would happily have either on my counter. I have a Panasonic FlashXpress Toaster Oven with Double Infrared Heating NB-G110 (approximately $90 - $105) and have been using it for years. You can get it at shop.panasonic.com. All I can say is that it is truly great for every use - toasting, oven, everything you would expect from a great toaster oven. Did I mention durable? I just purchased another to replace it after many years. The only reason is that I wanted it in Stainless as opposed to off white. I’ve seen a number of strong reviews for the Panasonic FlashXpress. Unfortunately, it was too small to include in our review as it is only a 4-slice model, and wouldn’t fit a 12-inch pizza or 3.5 lb chicken. If we come back with a small toaster oven review, we very well may have the Panasonic in the running. Cover yourself with Extended Warranty if you buy Breville!!!!!!! The Breville offers only a 1 year limited warranty whereas the Cuisinart offers a 3 Year Limited Warranty. With that said, you should buy an add on plan like one from Canopy (3 year warranty for only $21.99). There are quite a few angry reviews on Amazon about Breville due to the 1 year Warranty. 1 Year is NOT good so buy an add on and reduce your grief IF it blows or malfunctions. I would add that there are far more positive reviews than negative but with ANY electrical device you might be that Customer that gets a Lemon so protect yourself. ESPECIALLY with Cooking Appliances. Happy Cooking to ALL with what ever Product you choose. Is there a moderately priced toaster oven that doesn’t heat up the kitchen or get extremely hot on the top and sides? Thank you and I love this site. The Panasonic Flash Xpress (NB-G110P) is around $120 on Amazon(http://amzn.to/2drETHL) and gets excellent reviews. It’s doubled-walled but isn’t otherwise insulated so, like other toaster ovens, it will get hot on the top and sides. However, unlike other toaster ovens, it uses instantly-hot infrared heating elements that reduce the preheating time of the oven. Less time preheating means it has less time to get hot on the outside. But it will get hot with longer use. I don’t know of any small toaster oven that is completely insulated to prevent external heating, though there may be some models out there. Though I would rather go with a toaster that performs well, like the Flash Xpress, than a poorer-quality model, just because it’s insulated. any place that lists the *exterior* temps? Thanks, again, for such a thorough review! The models are pretty much the same as when we first did the testing. We didn’t try baking breads, though I suspect that the Cuisinart and Breville would both do a decent job with it, especially if you used the convection mode for more even heating. The Cuisinart should be able to handle a 5-pound chicken - it’s a pretty big oven. The Breville may be able to, as well. Exterior temps vary quite a bit based on internal temp and cooking time. The ovens are fine for a bit, but will get quite hot after five minutes or more. Not hot enough to start a fire, but you wouldn’t want something on them that could melt. I baked two loaves of bread in my Breville Smart Oven Pro, first with the convection fan on, the other with the fan off. The fan caused the bread to be so hard and dry on top it was almost inedible. The loaf baked without the fan turned out perfect. So the Breville I can report bakes a nice loaf of bread. It’s helpful to have updates from actual users. Did you try using a lower temperature with the convection setting? Because the circulating air heats faster, many recipes recommend cooking at 25-50 degrees lower when using convection. Though if it works great without the fan, why mess with success! Cuisinart TOB 260- For bigger jobs, the versatile Cuisinart Chef’s Convection oven is among the top choices for toaster ovens. This model is capable of toasting up 9 slices of toast, roasting a whole chicken and cooking a 13- inch pizza at once. As compared to the Panasonic Flashxpress, this model is double the size and has a much bigger oven cavity that can cover several cooking tasks at a time. As compared to other toaster ovens of the same price, this one is capable of cooking food evenly and thoroughly. It also comes with more accessories, a good warranty time and one of the shortest preheating time. Many other toaster ovens that come at this price do not offer even heating as they concentrate heat only towards the center and the extreme ends of the oven, whereas, this one makes sue that the food is cooked properly from corner to corner. This model features a number of accessories: a baking pan, two racks, ceramic pizza stone and a broiling tray. The pizza stone is very useful as it helps make crisp, golden brown pizza crust. Many of the competitors of the same price offer a flimsy pizza pan and a single rack. A standard quarter sheet tray can be easily fitted into the wide oven cavity. The model has metals hooks that help pull the middle rack out when the door is opened and four slots for the racks. It only takes 3 minutes for the model to preheat to 350 °F. As compared to other models the preheating time is pretty impressive as well. This unit comes with an unusual feature that is not easily found in other toaster ovens: a setting known as dual mode. This allows you to hook two existing modes together to play out back to back, hence you can program your own cooking cycle. For example, if you are baking cinnamon rolls, by utilizing this mode not only can you bake the rolls to perfection, but you can also run a 10 minute warming cycle automatically after the rolls have been baked. The model comes with a three-year warranty, which is very impressive since most of the models only offer one-year warranty. Overall, this model is very good at performance and has an amazing capacity. If your profession requires frequent baking or you just need a big sized, efficient toaster oven at home this might be your best pick.